I wonder where this poster was from, as I paid 2000W for mine. Never noticed regional/location pricing before. Can't believe it's been over a week since the last review. I've been pretty busy, since some family members are down in Singapore to witness as my fiancée and I registered our marriage. Our ceremony is in June, but we technically married last Friday, so I think its a pretty good excuse to be late with the next review. Sadly, my mother never bothered to bring down a Texas Burger from Narita Airport for me, so I couldn't re-review the Burger. But she did bring me a limited edition pie from Canada, so once I get those from my wife's (wow that feels strange) camera, I'll post up a review. 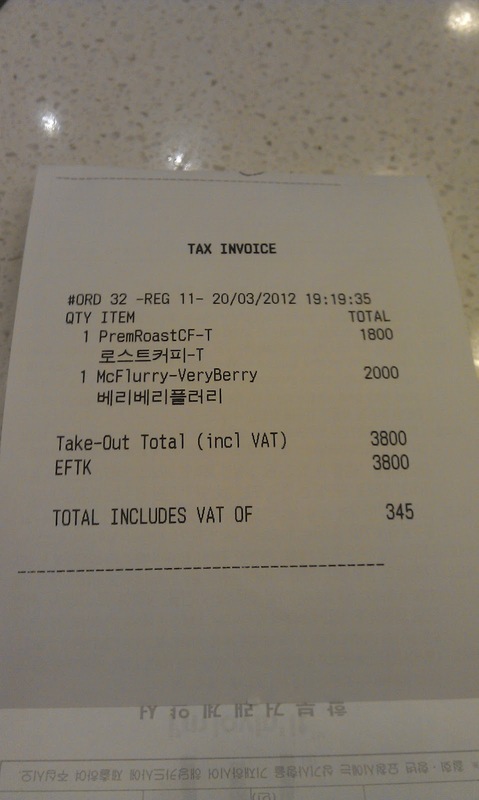 Until then, the review of the Very Berry McFlurry, which was a long running promo item in Korea during the early months 2012 will have to do. You'll notice that the Very Berry was slightly cheaper in 2012 than the Blueberry items were in 2011. If you've ever tried to buy Blueberries in Korea, you'll know why. A packet that is anywhere from $2-5 in the rest of the world, is easily $25 in Korea, much more if you buy it in the wrong supermarket. The Very Berry sauce was a combination of Blueberries, Raspberries & Strawberries, and you can tell just from the colour of the sauce, that is mostly what made up from the latter. The Very Berry sauce was similar to the standard menu ChocoBerry McFlurry, which a Strawberry/Raspberry flavoured sauce + Oreo pieces. Both have a strong hit of artificial raspberry and strawberry (but no real chunks of fruit as they did in Malaysia) but with the Very Berry, the subtle taste of Blueberry is apparent. It was nice to see that they didn't skimp out on the amount of sauce, and though I don't have any more photos from when we ate further down into the cup, but I remember not being bothered by the amount provided. 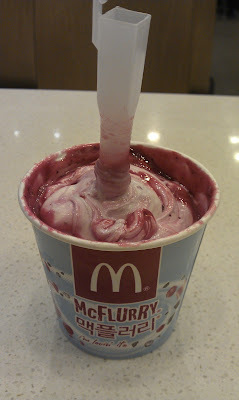 Though it tasted artificially sweet rather than using the natural sugars from the fruit, it wasn't the worst McFlurry topping that I've had. It was like what you would expect from a medium-grade jam, enough 'fruit' to not think its gross, but far from great. It would have been better if they included chucks of fruit. It's not something we wanted to order again, but good enough to try once. I'm also a little confused over the pricing. When I searched for the marketing photos, I found that all the poster has it priced at 1900W, but my receipt says I paid 2000W. I've never noticed pricing variants in Seoul, McDonald's before, even the Incheon Airport branch I thought was the same as the rest. The branch I had mine at (Myungdong), is definitely aimed at tourists. Maybe it was 1900W outside Seoul, or I just never noticed the 100 difference? If you know the answer please leave a comment. Just wanted to say I visit your blog from time to time and I still find it awesome every time I visit! Thanks! Thanks a lot! Its always nice to hear from readers.